Do you struggle focusing or holding yourself accountable? As you know, if you want to work for yourself, you’re going to need to figure out how to hold yourself accountable and in a way that works for you. 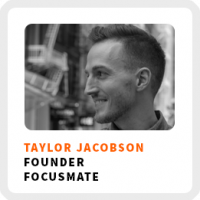 Taylor Jacobson shares his own struggles with focus and the unique solution he devised to hold himself accountable and why he believes it can work for you too. Born out of his own struggles for maintaining his focus, he founded Focusmate, a platform that connects people anywhere in the world to work together at the same time to hold each other accountable. Why introductions to people you want to connect need to be carefully curated. How Taylor discovered he’s a productive procrastinator and what he did about it. How he defines a mastermind group and his approach for putting one together. Why you can build a deeper rapport with someone by suggesting doing an activity you share in common, instead of the default meeting option of grabbing a coffee or a drink. Core work activities + habits: 1) Planning and prioritization. 2) Setting the vision for the company and articulating it to the team. 3) Recruiting resources through building deep relationships to help in success. Ideal work environment: In a quiet, pristine, totally set up, and optimized home office environment – using Focusmate. Regains focus by: Taking a few deep breaths and then consciously doing something about it. 1) If you bring on investors, you’ll have to shoot for the moon since you have equity holders so if you want to build something that aims that high, it could make sense to bring on investors. 2) If your market is huge and you think there’s a risk you won’t succeed without funding. 3) If making your business defensible is really important, which makes speed important, then bringing in outside resources can help.